PLEASE NOTE: The information and description included in this website on local businesses is provided by the business for informational and promotional purposes. 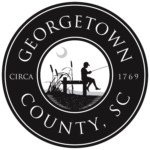 The Georgetown County Tourism Management Commission does not provide, verify or in any way endorse the descriptive information provided by the members regarding their business, trade or services. In the event of a grievance or concern with a local business service or product, communication should be made directly with the member. Personally Identifiable Information: The Georgetown County Tourism Management Commission gathers personally identifiable information (name, e-mail address, etc.) and/or demographic data (zip code, interests, etc.) that you submit when you: 1) contact us, 2) complete a survey, 3) register for a promotion, contest, or sweepstakes, 4) sign-up for our mailing list, or 5) send us an e-mail. This information may be gathered through both on-line and off-line means. We may use this information to compile demographic statistics about our users, and display to you information that matches your interests and profile. All subscriber information is handled responsibly and never sold or rented. You will be offered unsubscribe opportunities in every communication; should you choose to unsubscribe at any time, your request will be handled promptly. Any questions about travel to Hammock Coast, SC, Georgetown County, SC, or about the Hammock Coast, SC eNewsletter can be directed to ljoseph at hammockcoastsc.com or by calling 1-800-770-7705. Web Traffic Data: The Georgetown County Tourism Management Commission servers gather industry standard information (domain, IP address, referrer, browser used, etc.) via Web server traffic logs. From time-to-time, The Georgetown County Tourism Management Commission will analyze these logs to better understand the traffic patterns of our site visitors. We also use Google Advertising Features, including Google Remarketing and Google Analytics Demographics and Interest Reporting. These contain no personally-identifiable information. We use this data to better understand how our site is being used which helps us upgrade it appropriately for increased ease-of-use and functionality. E-mail Communications: To help us make e-mails more useful and interesting, we often receive a confirmation when you open e-mail from us if your computer supports such capabilities. If you do not want to receive e-mail, every email communication has a link to opt-out of the list. To make a request to our database administrator, please use our Contact Us page. Note: The Georgetown County Tourism Management Commission may, from time-to-time, update this privacy statement without notice.